He discusses a strategy in which the investor purchases non-cyclical stocks at low P/E's when a roaring economy may be coming to an end. The safety of a non-cyclical major (secular growth stock), like P&G, will appeal to investors as a safety net as the market begins to decline and in-vogue growth stocks lose their luster. This will inevitably raise the price of P&G - and you've beaten them to the punch! Once the P/E for the secular growth stock is high, ditch it and purchase a cyclical. The cyclical's P/E will be high now due to decreased earnings, but those earnings will begin to pick up again as the economy begins to again boom. To add to Cramer's insight, Ray Dalio gives a very informative overview of the "How the Economic Machine Works". He discusses the printing of money by governments and the use of debt/leverage on an individual and macro basis, while providing historical references to illustrate his theory. As more money is printed and interest rates remain low, borrowing and spending will increase until inflation and GDP growth hits government targets. At that point, rates are raised, money printing slows, and spending decreases, as the government tries to keep the economy in balance. Armed with this information, where are we in the cycle today? 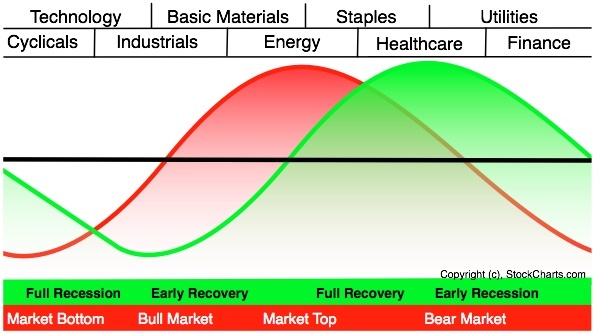 While not perfect, Sam Stovall's chart in "Standard & Poors Sector Investing" shows a relatively accurate representation of the typical relationship between a market cycle and an economic cycle. The market cycle appears to be in the mid to late stages of a bull market - possibly at a market top - and, according to the above chart, the economic cycle should be showing signs of growth, approaching a full recovery. While economies world wide seem to be plugging along, it is doubtful many would label our current state as a boom or full recovery. However, with the amount of money printing and quantitative easing governments have partaken in over the previous few years, it is difficult to imagine this sluggish growth will continue indefinitely. At some point, that cheap money will trickle down through the many economic layers and reach the main street businesses it was ultimately meant to benefit. Consequently, it is also hard to imagine energy and commodities can stay below their respective costs of production indefinitely, as businesses spend more into a strong economy, raising demand for oil, copper, etc. As previously mentioned, an astute value investor has likely transitioned to basic materials and energy - and endured a beating in the process. This beating may be coming to an end and the value investor's endurance may begin to pay off. The laws of supply and demand shall eventually prevail! - As they have done throughout history - and as economies throughout the world strengthen, commodity and energy demand should increase in turn. His bets on low p/b, out of favor sectors, may come to fruition in the short to mid term. Commodity and energy stocks simply can not stay this low forever. As the market peaks and begins a downward trend, commodity and energy stocks will have already bottomed, leaving little room for further depreciation. The best-of-breed companies in these out of favor sectors offer big value as they begin to be perceived as safe havens. The BHP Billiton's (BHP), the Chevron's (CVX), and even the Teck Resource's (TCK) of the world will survive the downturn and come back stronger when world economies further strengthen and lesser companies cease to exist. Play the cycle! I think if more people understood and accepted the fact that the stock market will always ebb and flow, rise and fall, boom and bust we'd have a lot less panic and more stability and resolve to hold our losers even through steep price declines. 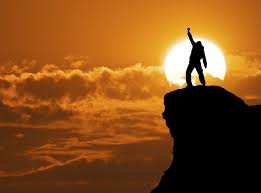 If the fundamentals of the business did not change why should my reason for owning it change. Hi DivHut, thanks for reading. I agree 100%. I had submitted this (edited, somewhat) to Seeking Alpha - http://seekingalpha.com/article/3464266-like-diamonds-cycles-are-forever-premature-thoughts-on-a-stock-market-crash - there's the link, if interested. Two commenters stated that, in reality, it is impossible to time the market. I think they completely miss the point. It's not about timing in the short term for a quick profit - it's, as you said, about finding fundamentally good companies and knowing that they will thrive in the future. The only problem with that theory is buying on margin. If an individual or money manager buys on margin and the market crashes like it has over the last week, they will be forced to sell, regardless of the company's fundamentals! It's a risky game - the upside can be tremendous, but the downside can be disastrous.